Preschool Science Investigation: How Does Water React on Various Surfaces? 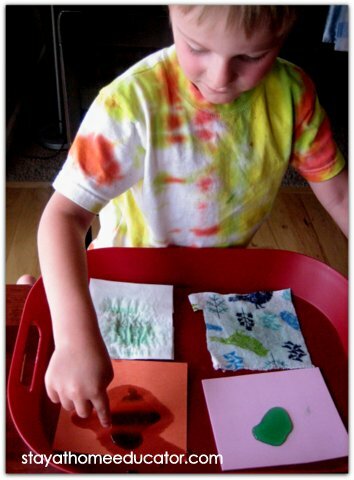 Teaching science to preschoolers can be a little intimidating to some parents or care givers, but this science investigation is not only easy to set up, using supplies found at home, but it also can be simplified enough that even young toddler can benefit from the basic scientific concepts taught through this investigation. 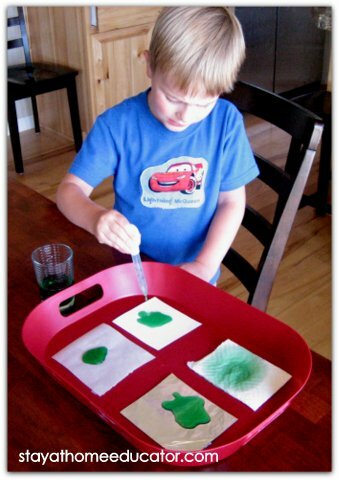 Supplied needed: a tray or pan to catch water, eye dropper, small glass of colored water (colored water is easier for little eyes to see), a scraps of printer paper, wax paper, aluminum foil, and paper towels. Begin by asking your child what they already know about water. 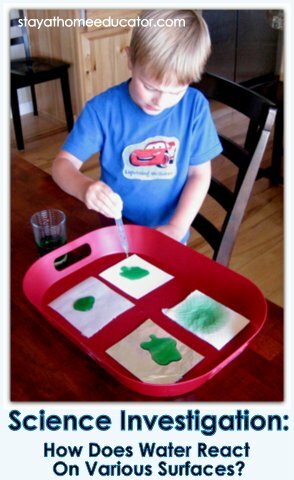 This gets the child into the mindset to learn more, and can also inspire future follow-up investigations. William told me that water was fun to play and swim in, that we use it to wash our hands and bathe in, that it comes from water towers, rain, rivers and lakes. He also mentioned that water must be cleaned before we can drink it or cook with it. He told me it feels wet and can be hot or cold. I recorded William’s words in a thought bubble on a sheet of printer paper with a drawing of him at the bottom. Then, I introduced the investigation to him. I said, “What do you think water does when we drop it on things like paper?” to which he responded, “I don’t know.” Perfect…all the more fun. I showed William the science tray and invited him to use the eye dropper to carefully drop beads of water onto each testing surface. 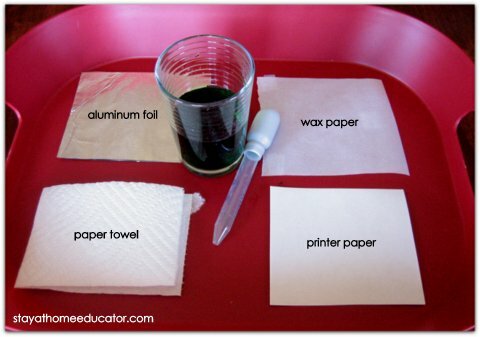 (Aluminum foil, paper towel, wax paper, and printer paper). I was so excited to hear the learning that was taking place in this simple activity. William said things like, “It just sits on the surface,” and “The water is getting soaked up,” and “The water spot is getting bigger.” With each statement, I took the opportunity to explain in simple terms what his observations meant. Following the activity, William promptly spilled the rest of the water on the kitchen floor. Before I could even react, he got a towel and said, “It’s ok, Mom, ’cause the towel is absorb like the paper towel and will soak up all the water!” Not a perfect use of the word absorb, but I was so pleased he was using a new vocabulary word from our investigation I couldn’t help but smile. Follow-up Investigation: What happened when water sits on various surfaces for a longer period of time? The next day, we did a follow up investigation using different materials. This time we wanted to see if the water sat on the material if it would be absorbed. We tested facial tissue, crafting foam, a plastic bag, a paper bag, construction paper, fabric, and cardboard. William was surprised to find that while the water tends to sit on the surface of some materials, if it sits long enough it will start to be absorbed by the material, as he is pointing out with the construction paper in the above picture.